The post The First Lady Is Missing appeared first on Louise Marley. Terrific chat with Rodger Nichols of Cover to Cover Bookbeat. The post Louisa on the radio with Rodger Nichols appeared first on Louise Marley. My publicist sent me the link to this WAMC (public radio) program. I knew it was a review of A SECRET HISTORY and I had a bellyful of butterflies! Happily, the butterflies soon subsided. It’s a charming review, and the clever Zazu managed to describe the feminist themes of the novel without making the whole thing sound tedious. It’s also short and sweet–the whole thing only lasts eleven minutes–but it is bound to add to your to-be-read list! It certainly did mine. The post WITCHES on the radio! appeared first on Louise Marley. The craft the Orchiere witches practice, the one they refer to as the “old ways”, is invented, based on an ancient and inherited system, deeply rooted in a matrilineal tradition. I’ve borrowed from Wicca, the neo-pagan practice developed in the mid-twentieth century, but the Orchiere witches are not Wiccan, nor are the witches of the Glamis line, who appear in the Book of Veronica. 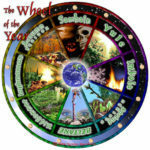 The Wheel of the Year is so lovely, though, and so evocative, that with the license granted to me as a creator of fiction, I’ve allowed my witches to use it. It also emphasizes the ancient history of their craft, and its connection with nature, which Wicca also celebrates. The rites of the Orchieres also borrow from Wicca and from other neo-pagan traditions. The circle of salted water for protection is one such element, as is the use of a newly-poured candle and a consecrated altar. The herbs they use in their rites and potions and philters are based in real herbology. In fact, many so-called witches of medieval times were innocent herbalists, useful in times of illness, but all too easily blamed when their remedies were unsuccessful. The witches of A SECRET HISTORY are neither the wicked hags of medieval times or the wacky suburbanites cooking up potions in their twentieth-century kitchens. They are women–grandmothers, mothers, granddaughters–with power. They are at risk because society has always feared women with power. Scripture provided an excuse to persecute them, and western culture has persisted in viewing them as dangerous, because they threaten the traditional balance of society. They endanger the fixed assignment of roles to women, and that frightens people. There will be more to come! Please visit again. The post Wicca and A SECRET HISTORY OF WITCHES appeared first on Louise Marley. The post RELICS appeared first on Louise Marley. The post Thoughts while vacuuming appeared first on Louise Marley. The post Writing on the Edge appeared first on Louise Marley. The post The Wonders Within: Medicine in Science Fiction appeared first on Louise Marley. The post Guest blog post appeared first on Louise Marley.